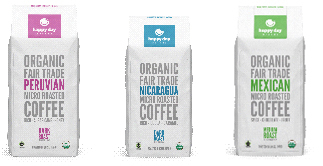 At Happy Day Coffee,their goal is to provide customers with the best possible tasting cup of locally roasted, fair trade and organic coffee. The company sources only the finest green beans from co-ops around the world. They carefully handcraft their coffee in small batches to create some amazing signature results. Happy Day roasting specialists believe every blend should be a work of find art, a delightful journey in taste, sensation, and interpretation. Available in 12 oz. Bags and 2 lb. Bags for retail, and 5 lb bags for bulk sales. Also retailers can have their products private labeled with their own store brand! Hugo Tea is certified organic. They aren’t a tea super-store, but prefer to do their work in small-batches, only selling the products that are truly exceptional. All of the tea leaves that we purchase are direct trade. This means they buy directly from the farmers who grow the teas, not from large tea exporters or distributors, like most tea companies do. It's fresh, clean, and grown with care. You can really taste the difference! 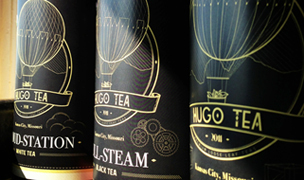 Hugo Teas are packaged in sealed tins. You have a choice of either loose leaf teas, or tea sachets (bags) for all types of teas offered. They have all the classic flavors covered, including 100 Year Green, Jasmine Green, Earl Grey, Berry Rooibos, Da Ye Xi Green, White Cloud, and Wonder Mint...9 kinds altogether. Excellent tea descriptions & detailed brewing instructions come on each tin, which completes a beautiful package! Also for summertime sales, Hugo has a line of 5 different Iced Teas. 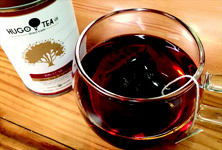 Each resealable packet contains 6 large tea bags, and each bag makes a whole quart of delicious iced tea! Looking for flavor without sweeteners or artificial flavors? Garlic It has done it again with Auntie Gretchen's Water Infusions. Infused water is a hot item these days with dieters and health minded consumers. for a typical water bottle. a tea infused sipping broth. Sipping broth is a unique blend of savory herbs and spices infused with green tea. Excellent as a healthy and delicious alternative to traditional coffee and tea.They are all natural and vegan. Flavors are Tomato Basil, Indian Spice, Thai Lemongrass, Spicy Tortilla, Smokey Facon. This fine line of teas uses a unique nylon mesh teabag and whole leaf teas in all their packaged teas. With many flavors to choose from, their packages also include 16 ct. retail boxes, 5 ct. boxes, 2-packs, and even individually boxed teabags great for food service accounts as wells as gift baskets.